The beginning of a new year is a great time to review your estate planning documents. And, if you have not ever created your estate plan, there is no time like the present! Julia Dean is the managing attorney at The Dean Law Firm, PLLC, a boutique law firm practicing in estate planning, probate, guardianships, elder law and civil appeals. Ms. Dean has been recognized as a Top Attorney and Leading Advisor by Acquisition International, Forbes, Newsweek, H Texas, Houstonia and Sugar Land Sun, and has earned Martindale-Hubbell’s Client Distinction Award. 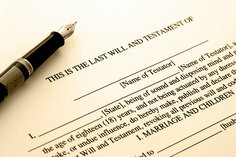 The Dean Law Firm is committed to bringing you peace of mind by providing thoughtful estate planning for your family.